With their penchant for seeking out unusual, savory Slavic spots in the city, it didn’t surprise me that my sister and Olga invited us to Taste of Samarkand—a kosher Uzbeki newcomer in Rego Park—for my sister’s 61st birthday lunch. We were a party of five, “Kirrill,” myself, my husband, Richard, Olga and her sister, Masha, visiting from Russia, a sweet, faded woman who seemed a shadow of Olga's vivacious, commanding self. The restaurant, named for the glittering city along the Silk Road, is in the ugliest strip mall imaginable. Yet, once inside you enter a comfy, woody space with fake grapes hang from ceiling lattices and waitresses wear traditional boxy embroidered hats with colorful tunics and harem pants. There are the obligatory thumping Uzbeki pop videos, booming in stereo from a flat screen at the back and front of the narrow space. Images of exploding military trucks laden with watermelons follow ones of ballerinas dancing in fields who swoon to a suave dark-haired crooner. We were famished and cranky. Olga immediately spoke Russian to the waitresses, as if saying, “We are not to be messed with.” She waved her hands in the air because the tea did not come fast enough. The weak green tea made from unidentifiable large spinach-sized leaves came in beautiful blue, white and gold pots with plates of candied pineapple and sugar-encrusted chickpeas, oddly addictive. Olga’s behavior embarrassed my patient sister, but I am more like Olga, so I was secretly egging her on. Finally the beaming apple-cheeked waitress came to take our order. Carol picked up her menu and pointed at the Cheburek ($1.75), described as an Uzbeki “quesadilla” with ground beef, greens and spices. I piped up, “How about the Ochor ($6.00), miniature eggplants filled with chopped “green leaves” (the same ubiquitous ones as in the tea?) and scallions. Turning the menu over, Carol asked about a signature Uzbeki dish, “plov,” ($8.00) a hearty lamb pilaf cooked in ample lamb fat. 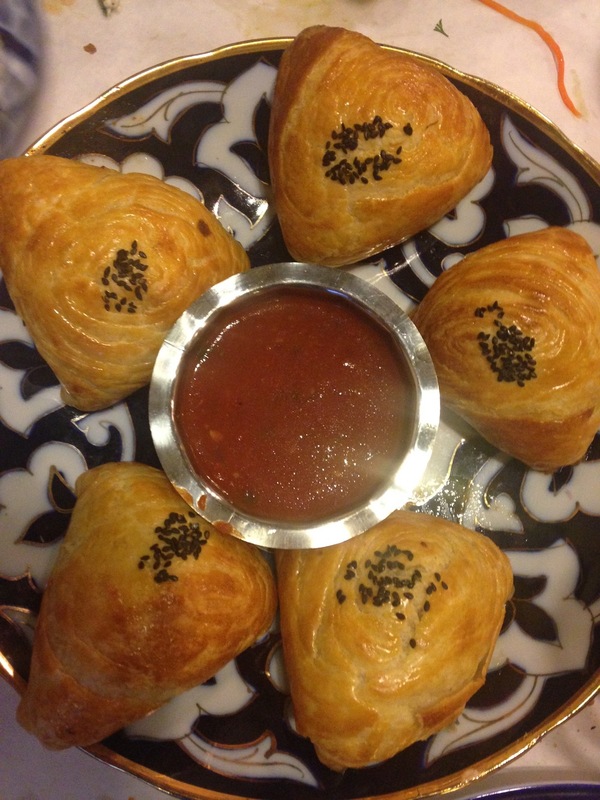 Richard asked for “Five each of of Manti and Samsa”($2.00/ea)—large palm-sized beef dumplings, steamed or fried. The best turned out to be the most simple dishes, the tender perfectly-grilled lamb kebab, with six cubes on a long metal skewer is a snack-attack steal at $4.50/each. 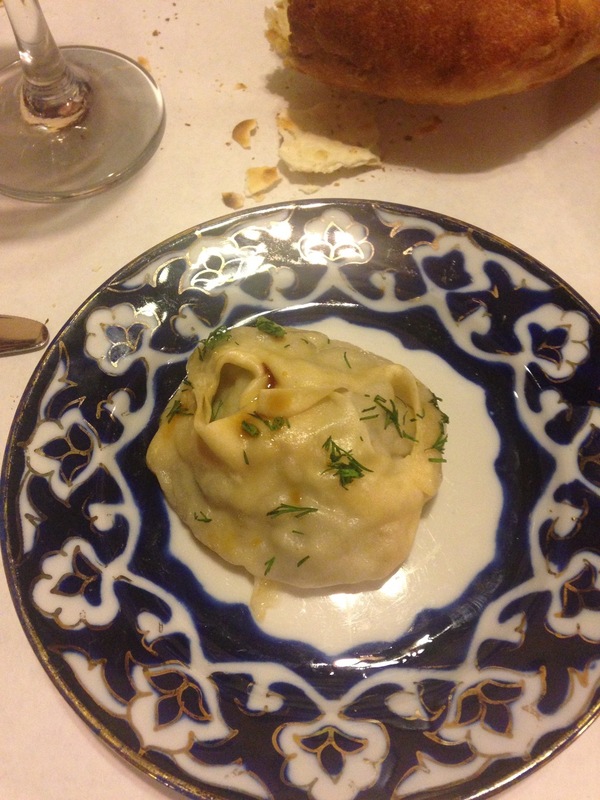 The long-awaited manti and samsa wowed everyone but me who thought them too stodgy. The Korean* carrot salad, was pickled, fierce and refreshing. We ordered three soups, Olga and Carol discussed the inferiority of their Mastava, a rice, beef and tomato soup ($5.00). “Campbell’s?” Carol asked me passing me a spoonful. 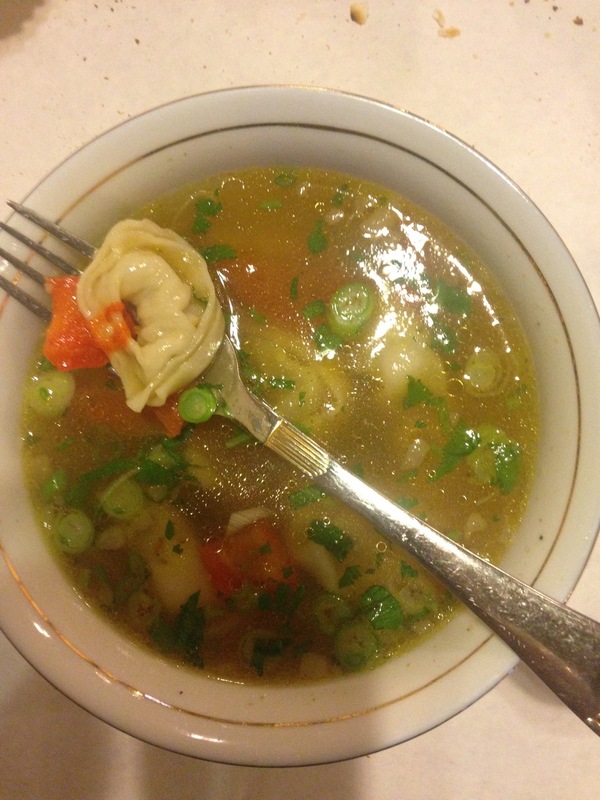 “Hmm,” I said, “Maybe Progresso," which was also how I would define my brothy, herbal "ravioli soup" ($5.50). Masha’s fiery lagman soup ($5.50) satisfied, though; peppers and tomatoes colored it deep red, and when we tried to share it, the hand-pulled lagman noodles were really one long noodle that my sister had to sever with a knife. Best of all, perhaps, was the experience of trying something so new, the camaraderie that developed over spoons and forks held over the table. “Kirrill try this! Nincy, try this,” urged Olga. And of course, one can’t forget the truly Russian restaurant birthday experience. Before our meal came, the lights turned off so abruptly we thought a fuse had blown, further thwarting our attempts to eat. A thumping Uzbeki-English pop rendition of Happy Birthday blared in surround sound (Hippy Hippy Birt-day tooo Yooo). My shy sister looked at me, dagger-eyed. But the cake went to another diner. “If you do this to me, I will kill you,” she whispered, as I looked sheepishly into my lap. I had already given the apple-cheeked waitress three mini-mousse cakes to bring out for our birthday dessert. However when I went in the back and whispered, “Is it possible to just bring out the dessert with no fuss,” she said flatly, “No. We must!” And so we did, and it made us all gay and lively. Sated, we walked out along Woodhaven Boulevard and swerved onto 63rd drive, Richard and I filling our bags with culinary riches in well-lit stores that catered to Slavic, Middle Eastern and Latino palates. We bought two tins of Riga sprats, walnuts, Nutella, all cheaper than at our local market. Masha marveled at the 99c stores. Like a grey mouse, she scurried in one after another in search of drinking straws. Are these hard to find in Russia? Expensive? And Olga and Carol, upon passing Cheburechnaya, again went into a tape loop of conversation, “Yes, Kirrill, Remember, here is where we went!” And sure enough, the menu listed lamb testicle shish kebab. For next time! 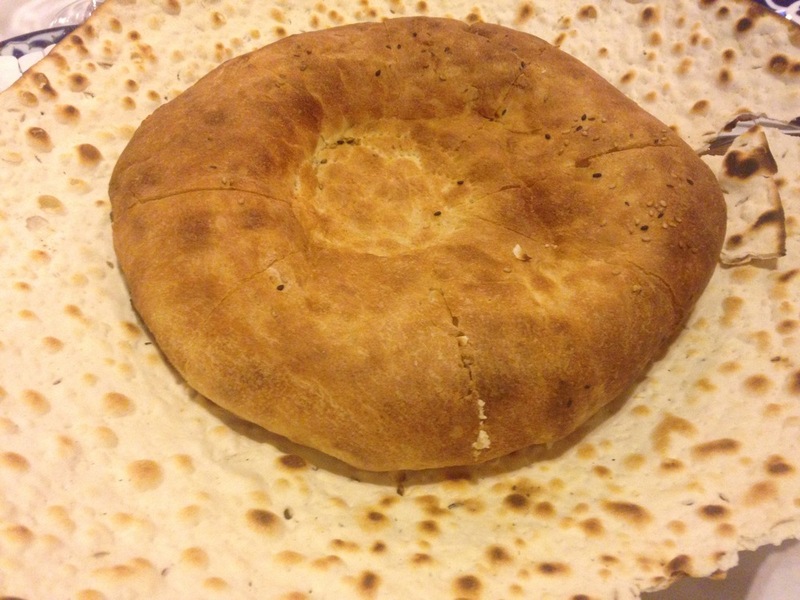 *For a wonderful culinary history of Uzbekistan and the Uzbeki and Bukharin population of Rego Park, and an explanation of why you find Korean food and flavors in Uzbeki restaurants: see this decade-old wonderful New York Times piece. P.S. Happy Birthday Carol! Hippy-Hippy-Birt-Day-Toooo-You today!